Temper Chocolate Pastry Owner and Chef Steven Hodge and his talented team have been busy working almost as hard as Santa’s Elves to create a tantalizing selection of festive treats. Just in time for the holidays, Temper has added a selection of seasonal truffles to their popular in-house assortment. Bite into Gingerbread and Rum & Eggnog truffles (available for a limited time) and enjoy them individually or elegantly arranged in a gift-ready box complete with ribbon. The festive flavours don’t stop there. Steven Hodge has gotten creative with his seasonal chocolate sculptures to capture the holidaysand crafted a handful of playful edible characters. 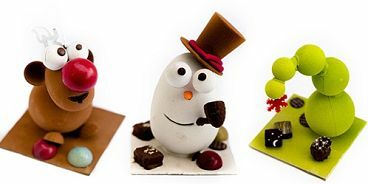 New for Christmas are the Temper Reindeer, Temper Snowman and Temper-style ‘Grinch’ Tree all adorn with chocolates. If you’re looking for a uniquely sweet gift, Temper has also created an exquisite dark chocolate box with lid that’s both filled and surrounded by assorted truffles and chocolates. New for the holidays, pick up a package of Temper’s own candied almond Rocher confections and stock up on stocking stuffers such as chocolate Candy-cane Bark, a chocolate Santa boot, brightly hued chocolate ornaments, individually packaged festive lollipops and mini ‘Salty Balls’ (which won Gold at the 2014 International Chocolate Awards. Stop by the cozy café and sip an Eggnog latte or recover from holiday shopping with a Rum & Eggnog and nibble on Temper’s festive house made baked treats. Enjoy a few almond vanilla shortbread cookies, jam crescent rolls, Croatian plum kiflice, walnut crescent cookies, ginger cookies or Bûche de Noël. Save room Temper’s Croatian-style Walnut bread and Brioche loaf (perfect for Christmas morning brunch). This holiday season, add some extra sparkle to your event or gift and order one of Temper’s custom made cakes made with top quality Valrhona chocolate and organic ingredients (where possible). Pre orders must be made by December 19th for guaranteed delivery.